Trust the French to know what they are about in the kitchen. Le Creuset was founded in 1925 after two men decided they could bring quality craftsmanship to professional and everyday kitchens around France. Today they are still satisfying housewives, house husbands, professional chefs, and amateur dabblers with their durable and lively products. Trust the logo, established way back in the 1970s: a solid orange circle surrounded by a black ring surrounded by a black “C”. If you see this sign on equipment, you know an item was made to last. Why is the Circle Orange? Le Creuset’s logo recalls their famous orange or “flame” line of kitchenware from the early days, made from cast iron, painted orange, enameled, and glazed. They still make products in this color but also numerous others like shades of green, blue, and yellow. Besides cooking pots and cast iron, they sell items for baking, eating, drinking, and wine appreciation. Le Creuset bought a company that makes wine accessories and has since sold innovative wine openers, etc. Food and wine: what a sensible pairing. The Holiday Palette is online: turn virtual pages to peruse a beautiful bounty of gifts for the gourmet. Items from the usual catalogue are featured here: products made from stainless steel, forged non-stick materials, and more like frying pans, knives, and baking dishes. Keep checking for the latest catalogue and newest fashions. One thing is for sure though… Le Creuset NEVER goes out of style. Totally classic! If you had to name five items your kitchen cannot be without what would they be? Would you name a stock pot, kettle, frying pan, coffee press, and loaf pan? Could your selection be more wine-related or incorporate knives and plates? Everyone’s list looks a little different, but it is all available with Le Creuset. Bake to your heart’s content, brew countless cups of tea, pour gravy over pot roast, and sip Sauvignon Blanc serenely using assorted dishes and accessories made from materials that will not break easily. Count on the quality to justify a higher cost than you might usually pay for kitchenware. You will find the price makes sense in the long run when you are still using a Le Creuset dish from 2015 in 2020 and all cheap imitations have long since cracked and broken. Ask for a set when you get married or leave home. By the way, Kitchen Universe has a pretty vast selection of Le Creuset bakeware and utensils. They offer free ground shipping on orders of $59. Check out their Le Creuset collection here. And, by the way, we DO have Kitchen Universe coupon codes! Why not save 5% off when shopping Le Creuset? Click HERE for the Le Creuset coupon code. Le Creuset’s bakeware line is made from metal, silicone, stoneware, and more. Their silicone baking cups evenly cook muffins or cakes but also release their contents without need of grease. They’re the latest and most popular idea since non-stick coating. Pie plates with bird’s heads in them let out vapor which would otherwise be trapped, creating a mushy pie or allowing liquids to settle in the bottom. The birds are sold separately and can be used to accompany your existing pie dishes. Choose items in multiple sizes: bowls, tart dishes, and more. Their catalogue even shows Crème Brûlée dishes. In France, they take coffee seriously. Create a sophisticated ambience around your cup of java to share with friends using a Le Creuset coffee press, cream and sugar dishes, mugs for Espresso or Cappuccino, and more. They also carry teatime accessories made to the same high standards. Don’t forget the French bread served on matching plates. Choose a method of cork removal from the screwpull to a lever or perhaps a corkscrew. Maybe cork is in short supply and you might find more bottles sealed with a cap, but there is still foil around your bottle top that has to be cut. How many times have you tried and failed to pick at it and release a flap with blunt fingernails, resorting to an open pair of scissors in the end? If you drink wine regularly, foil cutters would make a nice gift: add it to your wish list or give them to someone who has spent more than enough time fighting with foil. Le Creuset also carries wine glass markers, a pump, an aerator, and a sleeve to keep wine cool. When you serve wine, serve it right. All you need now are glasses and a wine varietal of equal quality to make your presentation complete. Many lines of kitchenware are focused on pretty patterns and busy ideas that change all the time. They go from Aztec to flowers to butterflies and every season there is something new available to replace your broken or chipped dishes. That is not the Le Creuset style. They started with solid orange and continue to promote solid colors. These bring an air of sophistication to your table and there is a shade to match any commercial or household kitchen. Since the brand is made to last, Le Creuset thought it best not to give way to gimmicks and trends that would be gone long before your Le Creuset has worn out. We tried to make a screenshot showing as many Le Creuset items in one photo as we could from the Kitchen Universe website, which carries loads of Le Creuset! 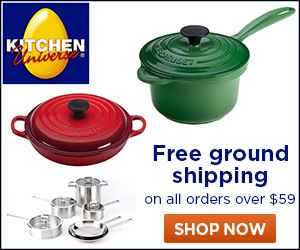 Click the image (or here) to see Le Creuset at Kitchen Universe.